Word has come from Peter Peer of the death yesterday (February 17) of his mother, Alice, a former pastor’s wife. My dearest mother, Alice Peer, went home to glory about 5:30 this afternoon at the age of 100 years, nine months, and 15 days. She was the wife of Pastor Earle Peer and twin sister of Angie Garber. Survived by Daughter Dorcas Reimer of Vancouver B.C. ; Son Peter of Westerville, Ohio; Son John of Columbus, Ohio; Grandsons Jonathan Reimer, currently residing in Cambridge, England; Andrew Reimer of Vancouver, B.C. 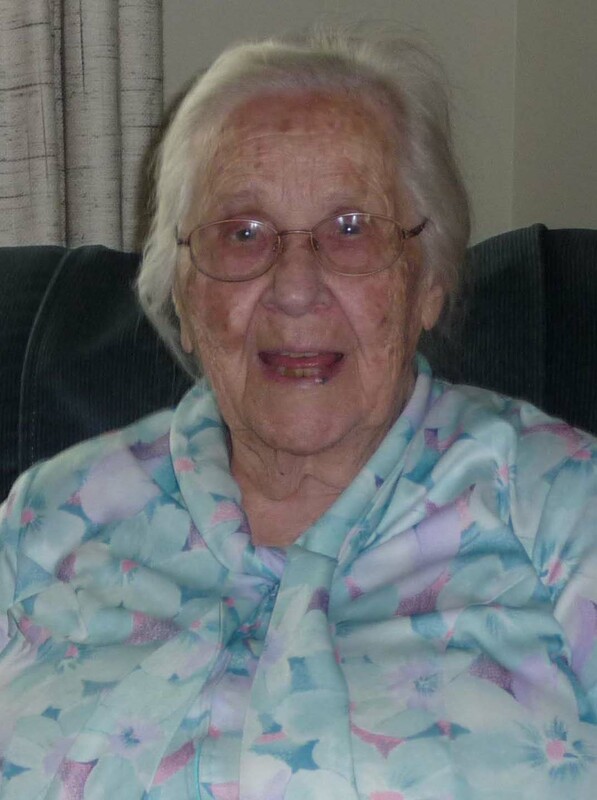 ; Philip Peer of Columbus, Ohio; and Frank Peer of Louisville, Ky.
We love her so much and she will be greatly missed. But we know she is rejoicing with her family in the presence of the Lord. Alice Peer celebrated her 100th birthday last year with an open house in her home in Westerville. As information regarding memorial services is known, it will be posted here. Alice M. Peer, age 100, of Westerville, Ohio, died February 17, 2013 at home. Born May 2, 1912 in Leon, Iowa. Graduate of Ashland University. Active in Grace Brethren Church as a pastors wife in Martinsburg, W. Va., Harrisburg, Pa., Berne, Ind., and Columbus, Ohio. Enjoyed painting and other art activities. Survived by children, Dorcas (William) Reimer of Vancouver, Brithish Columbia, Canada; sons, Peter Peer of Westerville and Jack Garber of Columbus; grandchildren, Jonathan (Thea) Reimer of Cambridge, England, Andrew Reimer of Vancouver, B.C., Phil Peer of Worthington and Frank (Amanda) Peer of Louisville, KY; several nieces and nephews. Preceded in death by her husband, Rev. Earle E. Peer, son, George Peer and daughter, Mary Ruth Peer. Funeral service will be at 1:30 on Thursday at the Moreland Funeral Home, 55 E. Schrock Road, Westerville, Ohio, with visitation from 10:00 until the time of the service. Pastor Dan Hammer will officiate. Interment will be at Blendon Central Cemetery.